It’s one apiece from Australia and Portugal. Both are finds from two of the buzziest trade tastings I’ve attended in a while – the Baga Friends and Australia Day Tasting. They brilliantly articulate what draws me to the wines of Australia and Portugal respectively. In a recent Decanter column (here) Andrew Jefford pondered whether Pinot Noir is now Australia’s most successful variety. Yabby Lake’s Tom Carson is one of the country’s leading Pinot practitioners but, at least in 2010 when he presented the Pinot Noir Masterclass at Wine Australia’s Landmark Tutorial in 2010, his take was despite “flashes of brilliance…producers still struggle with consistency… there’s still a lot to do.” Would he agree with Jefford now? There’s no question that the quality of Australian Pinot Noir has improved in leaps and bounds – especially with a run of more Pinot-friendly vintages, of which 2010 and 2012 stand out. Australian winemakers are nothing if not relentless in their pursuit of excellence and Carson has the distinction of producing the first Pinot Noir to win the prestigious Jimmy Watson Trophy at the Royal Melbourne Show, Yabby Lake Block 1 Pinot Noir 2012. It’s a terrific example of Pinot (to be reviewed shortly) but, for less than a third of the price, the entry level Red Claw blew me away with its easy Australian charm. Its heady violet fragrance sings, as does its joyously pure and juicy red cherry and currant fruit. Supple and savoury suede tannins together with just a hint of earthy beetroot lend dimension and depth. As fine and delicious a Pinot Noir as I’ve encountered for under £20. I’m told it and the Block 1 are currently on the water. Make sure you bag some when it arrives. £17.95 at Swig. While Australia has very successfully put its own spin on the world’s most famous grapes, Portugal’s great strength is its native varieties. Nowhere but Bairrada produces single varietal Baga and those dedicated to the cause – the so-called Baga Friends – skilfully showcased its world class potential at a tasting last week which, changed hearts and minds. 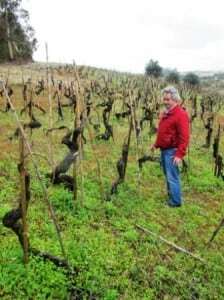 Bageiras is at the more traditional end of the spectrum in terms of the approach to winemaking. This wine was fermented with stems in lagares and aged in toneis – large, old wooden vats. So no flattering oak and no shortage of tannins. But optimal site selection (steep, south-facing slopes on chalky clay soils) combined with low yields produces powerful ripe tannins wed to fabulously concentrated, coal-black muscular fruit. And although this wine weighs in at 15% alcohol, given Bairrada’s Atlantic location and Baga’s naturally high acidity and tannin, its black currant and wild bilberry fruit is vividly fresh and well-defined. Shot through with the region’s signature pine needle and earthy, savoury woodsmoke layers (a function of chalky clay soils not oak), it’s a unique blend of sophistication and rusticity. Though its cellaring potential can be measured in decades this magnum proved that contemporary Baga is not the tannic beast of times past. I’m truly thrilled that Bageiras’ wines are now being imported by leading Portuguese wine specialist, Raymond Reynolds.